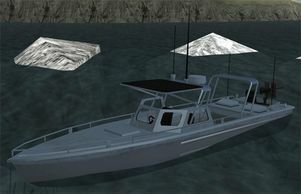 The Launch is a light patrol boat available only in Grand Theft Auto: San Andreas. The Launch is essentially a medium-sized boat with armor plating, which is purely cosmetic and will not protect it from taking damage. It has a .50 caliber machine gun on the back; it, however, cannot be used by the player or any NPC, and is considered a static object. Other than that, the boat is also available with minor roof configurations, including a canopy over the front seats or the middle compartment, or having no canopy at all. The boat is also painted blue. Its speed and handling is fairly good, on par with similar sized speedboats such as the Speeder and Predator, but is affected by its "heavy" armor. The Launch occasionally spawns inside the Easter Basin Naval Station in Easter Basin, San Fierro. However, entering the Naval Base automatically gives the player a 5-star wanted level, which means the Launch is tricky to obtain. The only instance of the Launch other than its constant spawning location is in the loading bay of the aircraft carrier during the mission Vertical Bird; unfortunately, it cannot be stolen from there as the rear door of the ship closes at the exact moment Carl passes under it. Coast Guard Launch, GTA Chinatown Wars equivalent. This page was last modified on 6 August 2012, at 22:01.